Wanna burn your Blu-ray files and now looking for the best Blu-ray burning software to do that? Well, you can refer to the following lists regarding top 5 best free Blu-ray burning software for Mac and PC. All software on the list could help you burn not only Blu-ray but also CD/DVD without any cost. Now take a look at the features of each and choose your favorite to burn Blu-ray/DVD/CD. Below are 5 best free Blu-ray burning software programs for Windows users to burn video to Blu-ray disc, folder and/or ISO image file. Some of these Windows best free Blu-ray burning software apps could even help burn ISO image file to Blu-ray disc directly. You could use these free Blu-ray burning software to burn Blu-ray files for totally free. If you have never used a free Blu-ray burner, I will recommend BurnAware Free for you. It’s now probably one of the most popular free CD/DVD/Blu-ray burning software available for Windows. Once you start this free blu-ray burning software, you will immediately know how to use it. Actually its interface is a one page screen that simply shows you the different things you can do with this free burner like creating data backups, audio and MP3 CDs; creating or burning ISO Image files. However, the free version doesn’t support disc copying or bootable discs. You need to get the paid version to use the two functions. Another solid and reliable freeware to burn CDs, DVDs and Blu-rays. With an interface that is quite similar to Nero, this free Blu-ray maker provides an easy way for you to burn discs. It can author data discs, create audio CDs playable in a regular CD player, create and burn ISO Image files. 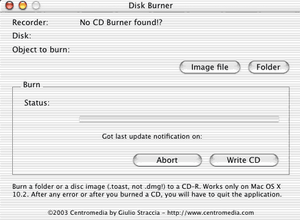 Unlike BurnAware Free, CDBurnerXP allows you to copy discs and create bootable discs for free. 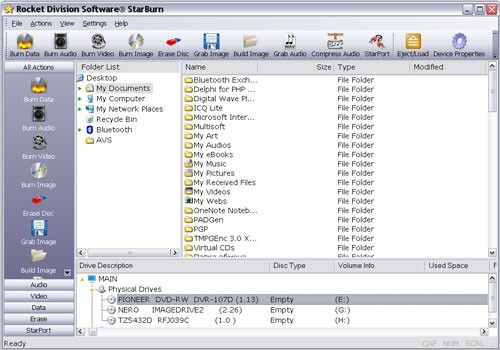 StarBurn is a nice yet totally free burning tool that allows you grab, burn and master CD, DVD, Blu-ray and HD-DVD media files. It has a nice GUI interface that splits your burning options into audio, video and data. You can take use of it to create ISO Images from discs or your choice of files. Besides, this free Blu-ray burner software has the unique ability to erase a disc and compress audio. My favorite CD/DVD burning apps for a long time and meanwhile a quite great free Blu-ray burning software. ImaBurn can write data from a variety of formats, burns audio CDs, ISOs, video DVDs including regular DVD and HD DVD, and Blu-rays. Besides, ImgBurn could read a disc to an image on your hard drive and build a disc image from files on your computer. It’s fast, easy to use and doesn’t cost a penny. FinalBurner is the last free Blu-ray burning software I want to introduce to you guys. It supports to create data, audio or video discs. It can also burn CD/DVD, create ISO Images and even rip audio from music CDs. A wide arrange of disc formats are supported by FinalBurner including CD-R/RW, DVD+R/RW, DVD-R/RW, DVD DL, HD-DVD and Blu-ray. If you’re using a Mac, you may be asking what is the best Blu-ray burning software for Mac. The below 5 best Blu-ray burning software for Mac list would be of great help to burning Blu-ray content from videos and ISO image files on Mac OS. As Mac Blu-ray burning software program, these Mac Blu-ray burning software all supports burning DVD, Blu-ray and create ISO image files on Mac. Blu-ray Creator for Mac is professional Mac Blu-ray burning software for Mac users to easily burn videos to DVD/Blu-ray disc, folder and/or ISO image file, and directly burn ISO image file to Blu-ray disc on Mac in one click operation. This Blu-ray burning software offers built video editor to allow you edit videos before burning to Blu-ray content, 3D movie creator to create 3D Blu-ray movies, disc menu editor to design and edit disc menu, etc. Roxio Toast has long been the flagship of disc burning, often supporting drives that Apple’s native burning software did not. In more recent times, it has become a full suite of applications, including utilities to help import and clean up audio and photos, import and export TiVo recordings, and even label and catalog your discs. Of course, the basic ability to burn discs remains. From common disc formats like, CD-ROMs, Audio CD, MP3 Discs, DVD-ROMs, and Video DVDS to lesser-used formats such as PhotoDisc, Enhanced Audio CDs, Video CDs and Video DVDs with DVD-ROM content. As the name would imply, the Roxio Toast 11 Titanium with Blu-ray Video Disk Plugin package allows you to burn your HD video content to discs that can be played on most commercial Blu-ray players. 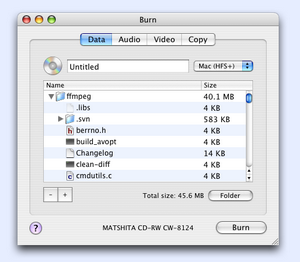 This is an all in one utility for Mac OS X when it comes to CD, DVD and Blu-ray Burning. This free software enables you to create dvd, organize the contents, and store all your digital content on the CD/DVD/Blu-ray Disc. Disc Burner also has an option to take image file from CD, DVD to your local hard drive. Where you can generate ISO files to share it with any OS Platform users. 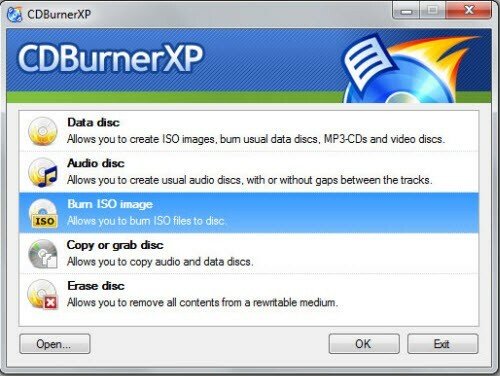 Burn, while simple, is a free effective burning software and has gain wide reputation for burning files to playable DVDs. You can use it to copy disc contents to back up and it also allows you to burn data, audio and video files conveniently. With intuitive interface and operation convenience , it is widely used for burning videos to DVD. Burning videos to Blu-ray content with Leawo Blu-ray Burner could be as easy as pie. You could make use of this Blu-ray burning software to burn Blu-ray disc, folder and/or ISO image files from videos in 180+ formats like MP4, AVI, FLV, MPEG, MOV, WMV, etc. Download this Blu-ray burning software via the links provided above. You can turn to Leawo Blu-ray Creator for Mac to burn video to Blu-ray content on Mac OS 10.6 and later. Insert a blank writable Blu-ray disc into Blu-ray recorder drive of your computer to burn video to Blu-ray disc. Click "Add Video" button to browse and add source videos into this Blu-ray burning software. You could also directly import source videos via drag-and-drop. After loading, you could play back loaded video files via the internal media player, edit loaded videos via the internal video editor, etc. Note: Set output disc type (BD-25 1280×720, BD-25 1920×1080, BD-50 1280×720, and BD-50 1920×1080, according to the Blu-ray disc you’ve inserted into the drive), and bit rate (fit to disc) at the bottom of this Blu-ray burning software. 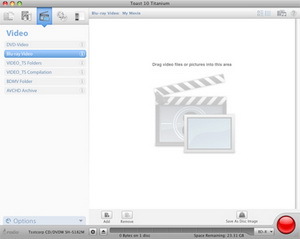 Via selecting a video clip and clicking "Edit" icon in the loaded video title, you can access to the "Video Edit" window, where you can edit your videos by trimming, cropping, applying special effects, adding watermarks, and adding 3D movie effect. 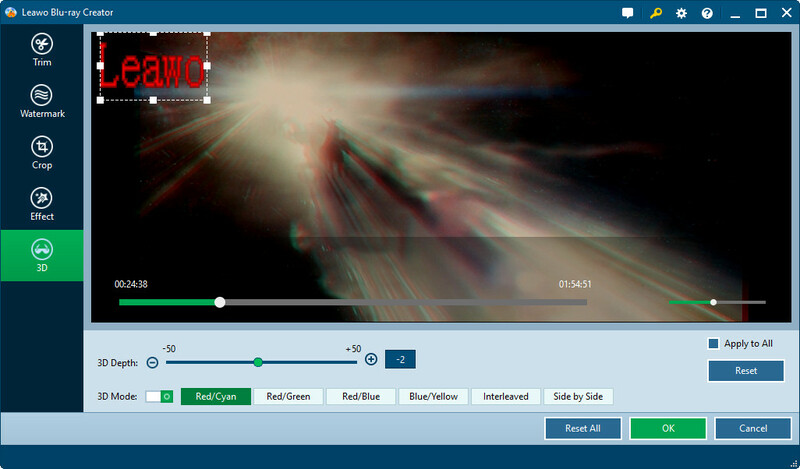 You could get customized Blu-ray movie by editing. Add a disc menu to output Blu-ray content from the right sidebar and get instant preview by clicking the center eye-shaped icon. 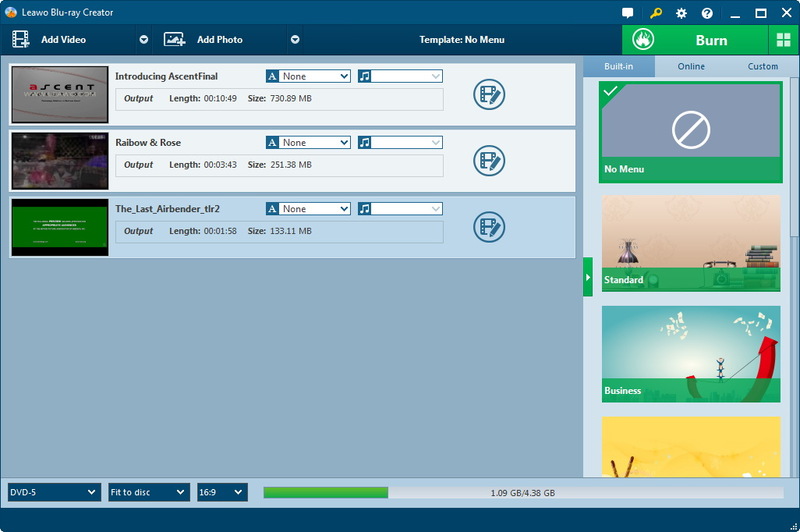 On the disc menu preview panel, click the pencil-shaped icon to enter the disc menu editing panel, where you can add text, background music and background image to customize the menu. If you don’t need to add disc menu, click "No Menu" option on the program’s right panel. Click the big green "Burn" button to enter the "Burning Setting" panel for further video to Blu-ray burning settings: choose to convert video to Blu-ray disc, Blu-ray folder or/and ISO Image; give output Blu-ray content a disc label; set saving folder for output file. To burn video to Blu-ray disc, insert a blank writable Blu-ray disc into Blu-ray recorder drive, select output Blu-ray disc type at the bottom of the main interface (mentioned in Step 1, according to the disc you’ve inserted), and then choose Blu-ray recorder drive as target under "Burn to" option. You could choose to create an ISO image file while burning video to Blu-ray disc as a complete copy of output Blu-ray disc. It requires enough storage space. 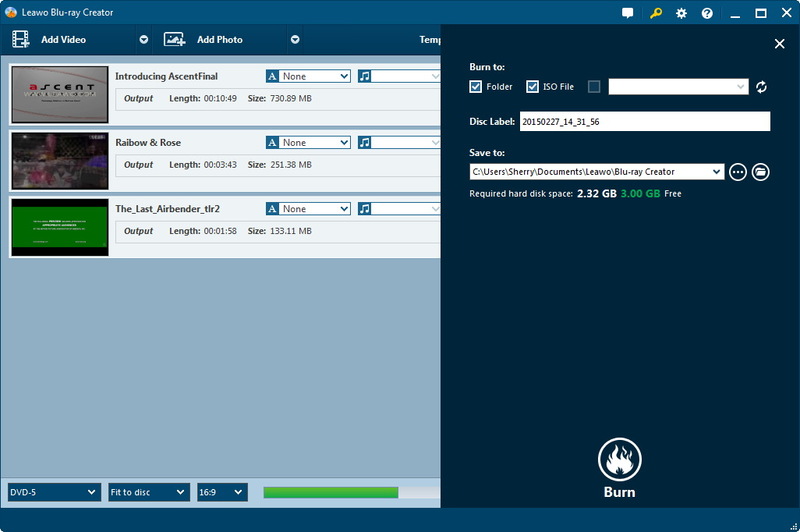 When all settings are OK, just click "Burn" button to start burning video to Blu-ray content on your computer within this Blu-ray burning software program. The Blu-ray burning process would get started immediately.